Show everyone that you came in 3rd place by proudly displaying the 3rd Place Ribbon. It’s a wonderful feeling to be awarded a good job when a lot of effort is put into it. 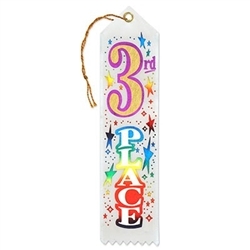 The 3rd Place Ribbon can be given at sporting events or other competitions. The 3rd Place Ribbon is a white ribbon that has colorful lettering that reads 3rd Place. The 3rd Place Ribbon also has a gold tassel attached at the top and the bottom of the ribbon has a serrated edge. On the back of the ribbon is a small white card that can be used to write in a name. Be sure to also check out that the 1st Place and 2nd Place Ribbon.